Fabrik Der Traume is another great bidding game by Reiner Knizia. It’s easy to learn and plays in under an hour. Each player is bidding on the pieces needed to complete their films, such as, Directors, Special Effects, Cameras, Music and Actors/Actress. For bidding, ‘contracts’ are used. There are a fixed amount of contracts in the game, so after the winner bid, those contracts are evenly divided among the other players. So you need to plan out your buys, for it may take a while to get back your contracts. 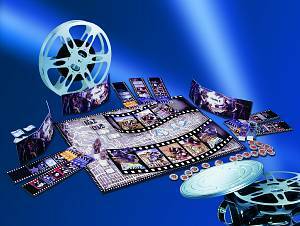 Each completed movie is worth points, which is based on the pieces collected for the film. Awards give you more points and are given out after each quarter and also at the end of the year. The player with the most points in the end is Hollywood’s newest super Producer. There’s plenty of enjoyment that this game offers and is worth having and getting into play. Outstanding auction game - especially if you are into classic movies.